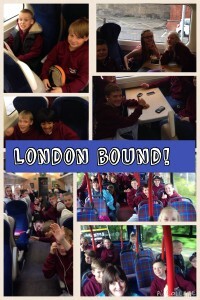 From the 2nd to the 4th of June, P7 went on a once in a lifetime trip to the Big Smoke for two nights with Mrs Marc, Miss O’Brien and Miss Chidgey. This was a great chance for P7 to make lots of amazing memories and to spend some quality time with each other before we take the big journey up to the high school. We all arrived at the school at the early hour of 8am so that we could get a bus to Waverly station to then get the train to Kings Cross in London. After a long but exciting train journey, we arrived at Kings Cross Station at about 2 o’clock. 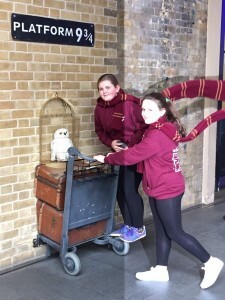 After that, we headed to platform 9 ¾ for some photos of us trying to get through the wall! Then we dragged all our bags to our hotel, The Royal National, and we relaxed for a small amount of time before we were up again and on our way to the Rainforest Cafe where we had an amazing time looking at the exotic fish and lifelike animatronics. We then walked to the Victoria theatre to watch ‘Wicked’, which was SPECTACULAR (and that was only day 1!). You can imagine how tired we were seeing as the show finished at 10:30pm meaning we got back to the hotel at about 11:00pm! The next morning, we were up for breakfast at 7:30am. We were so excited because we were going to Harry Potter world/Warner Bros studio tour. During the tour we had an insight into the creation of this spectacular franchise. This included: trying butter beer, getting pictures of us on broomsticks in front of a green screen, looking at the biggest ever model of Hogwarts and lots more. It was AMAZING!! We then got changed and started our journey to the next show, ‘Matilda’. This show was exhilarating at points, sad at others and it was also quite funny. The changes they made improved the story and made sure that the story was not boring. We then walked back to the hotel and passed out for the second night. We were certainly happy to see our pillows! 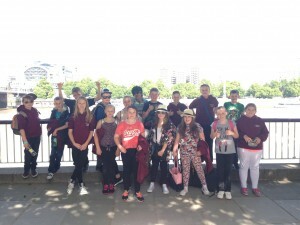 We then woke up for the last day in London, it was a long day of walking as this was the day we went on the London eye and we went sightseeing. From the London eye we could see most of London and it was wondrous. 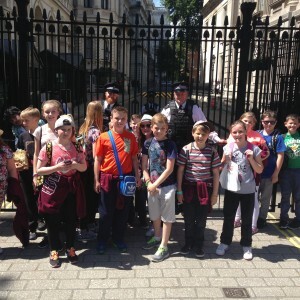 We then walked around London looking at all of the big attractions like Big Ben, 10 Downing Street and lots more. After a long few days we were finally ready for our trip home on the train. We got home about 9 O’clock on Thursday, leaving with memories we would never forget!